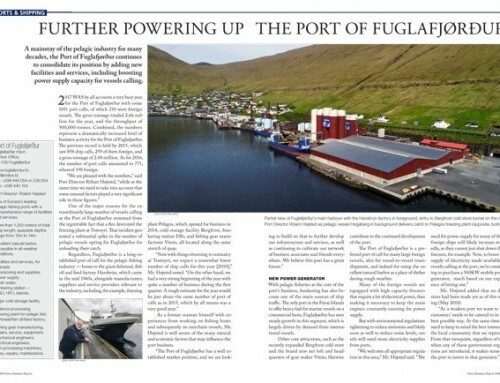 With infrastructure development aimed at establishing regular container services in the Port of Fuglafjørður, a long-time Northeast Atlantic hub for the pelagic fishing fleets continues its commitment to the industry. 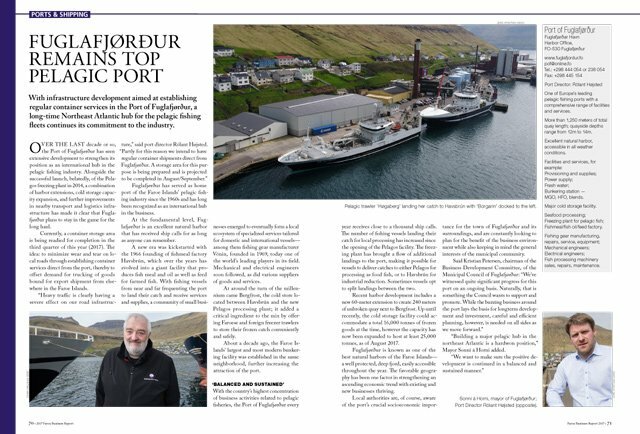 Over the last decade or so, the Port of Fuglafjørður has seen extensive development to strengthen its position as an international hub in the pelagic fishing industry. 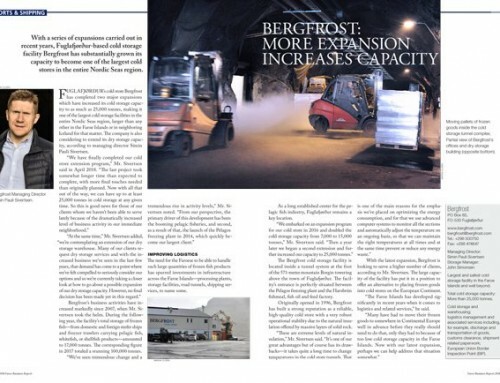 Alongside the successful launch, belatedly, of the Pelagos freezing plant in 2014, a combination of harbor extensions, cold storage capacity expansion, and further improvements in nearby transport and logistics infrastructure has made it clear that Fugla­fjørður plans to stay in the game for the long haul. Currently, a container storage area is being readied for completion in the third quarter of this year (2017). The idea: to minimize wear and tear on local roads through establishing container services direct from the port, thereby to offset demand for trucking of goods bound for export shipment from elsewhere in the Faroe Islands. Fuglafjørður has served as home port of the Faroe Islands’ pelagic fishing industry since the 1960s and has long been recognized as an international hub in the business. At the fundamental level, Fuglafjørður is an excellent natural harbor that has received ship calls for as long as anyone can remember. 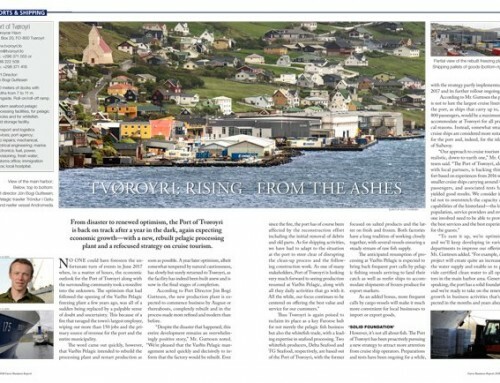 A new era was kickstarted with the 1966 founding of fishmeal factory Havsbrún, which over the years has evolved into a giant facility that produces fish meal and oil as well as feed for farmed fish. 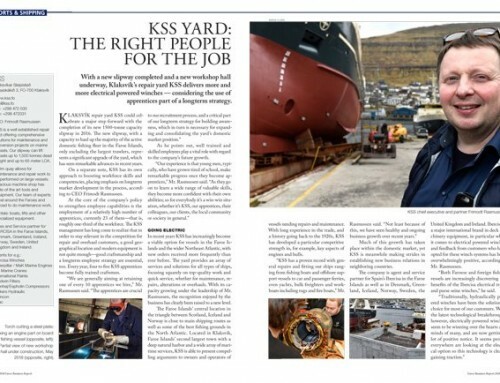 With fishing vessels from near and far frequenting the port to land their catch and receive services and supplies, a community of small businesses emerged to eventually form a local ecosystem of specialized services tailored for domestic and international vessels—among them fishing gear manufacturer Vónin, founded in 1969, today one of the world’s leading players in its field. Mechanical and electrical engineers soon followed, as did various suppliers of goods and services. At around the turn of the millennium came Bergfrost, the cold store located between Havsbrún and the new Pelagos processing plant; it added a critical ingredient to the mix by offering Faroese and foreign freezer trawlers to store their frozen catch conveniently and safely. About a decade ago, the Faroe Islands’ largest and most modern bunkering facility was established in the same neighborhood, further increasing the attraction of the port. With the country’s highest concentration of business activities related to pelagic fisheries, the Port of Fuglafjørður every year receives close to a thousand ship calls. The number of fishing vessels landing their catch for local processing has increased since the opening of the Pelagos facility. The freezing plant has brought a flow of additional landings to the port, making it possible for vessels to deliver catches to either Pelagos for processing as food fish, or to Havsbrún for industrial reduction. Sometimes vessels opt to split landings between the two. Recent harbor development includes a new 60-meter extension to create 240 meters of unbroken quay next to Bergfrost. Up until recently, the cold storage facility could accommodate a total 16,000 tonnes of frozen goods at the time, however the capacity has now been expanded to host at least 25,000 tonnes, as of August 2017. Fuglafjørður is known as one of the best natural harbors of the Faroe Islands—a well protected, deep fjord, easily accessible throughout the year. The favorable geography has been one factor in strengthening an ascending economic trend with existing and new businesses thriving. Local authorities are, of course, aware of the port’s crucial socioeconomic importance for the town of Fuglafjørður and its surroundings, and are constantly looking to plan for the benefit of the business environment while also keeping in mind the general interests of the municipal community. 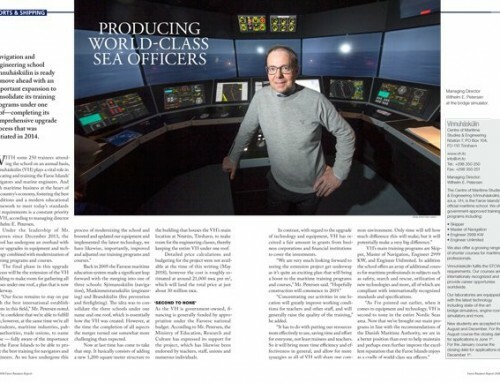 “Building a major pelagic hub in the northeast Atlantic is a hardwon position,” Mayor Sonni á Horni added.